Mary McMahon (2006). St. Audoen's Church, Cornmarket, Dublin: Archaeology and Architecture. 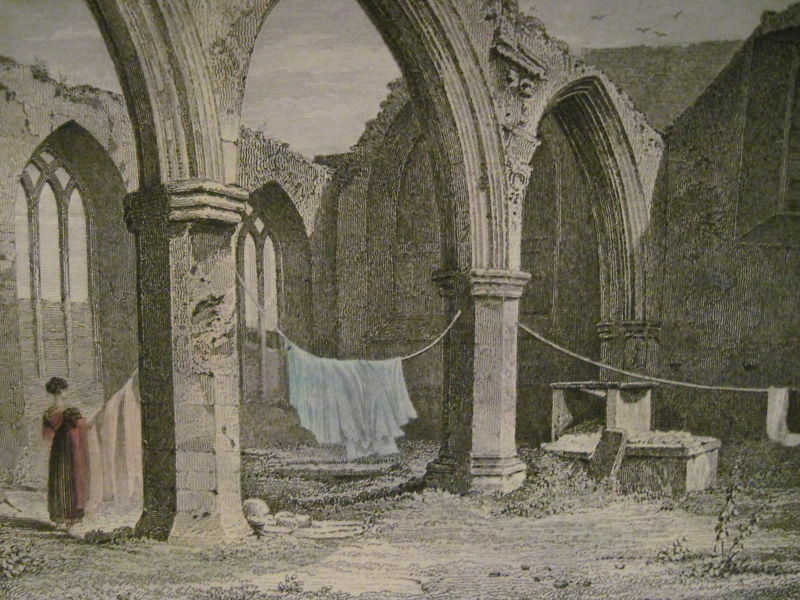 "Lord Portlester's Chapel: St Audeon's Church Dublin", The Dublin Penny Journal, vol. 1, p.201, Number 26, December 22, 1832. St.Audoen's Church, High St, Dublin, was founded in the 12th century. See street view and 45 degree aerial view of the church. 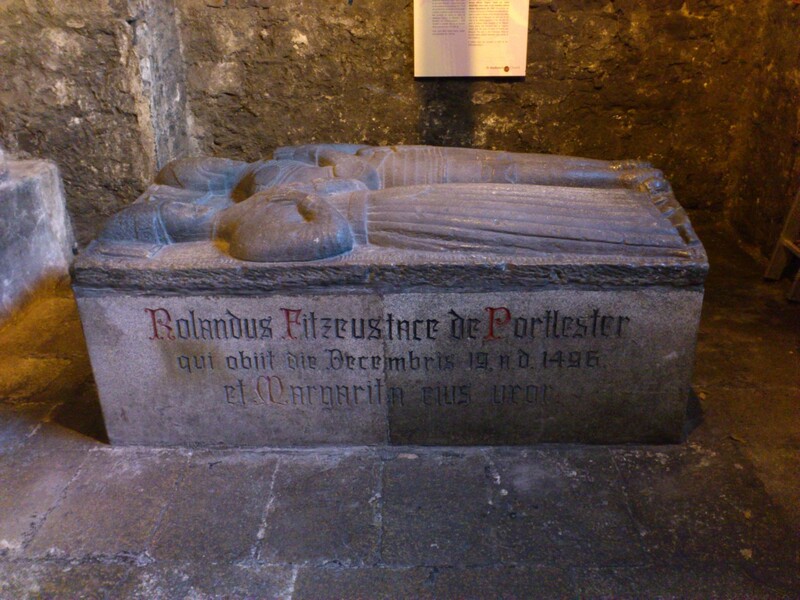 The "Portlester Chapel" (the SE chapel) at St.Audoen's was built 1482 by Rowland FitzEustace, Baron Portlester. 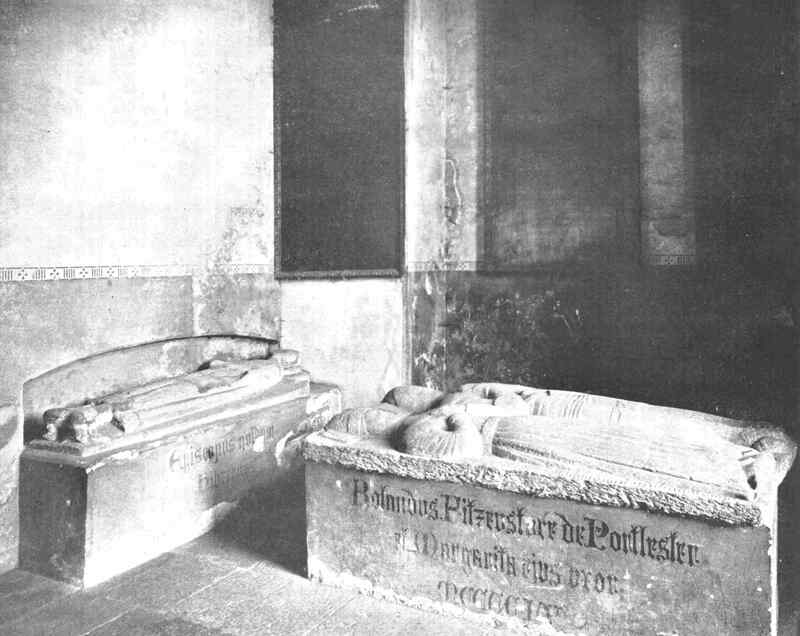 His 3rd wife Margaret Dartas was buried there before 1496 [Tickell, 1955]. He died 1496. 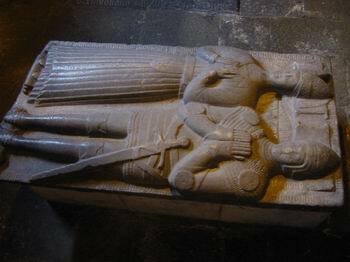 He was buried in Co.Kildare, but effigies of him and his 3rd wife were placed at her grave in the Portlester Chapel in St.Audoen's. 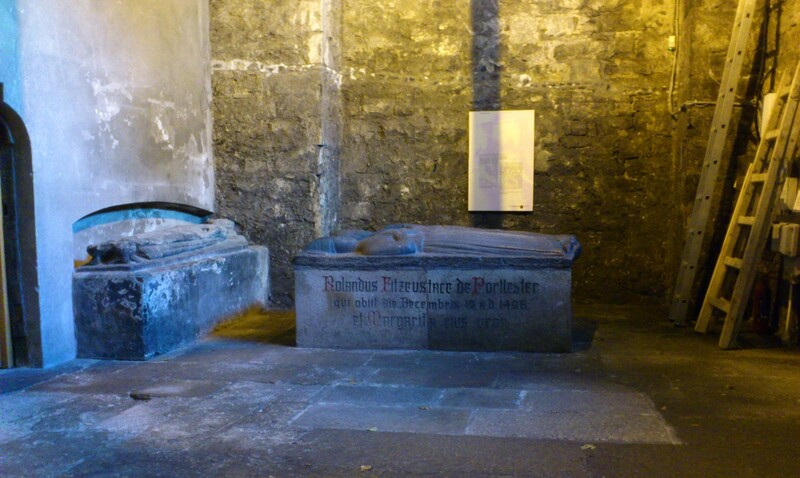 Later these effigies were moved to the base of the tower, and survive there today. [McMahon, 2006] says the correct reading of the inscription on the monument (dating the chapel) is 1482, NOT 1455 which it has been incorrectly read as elsewhere, including on the plaque at the site. 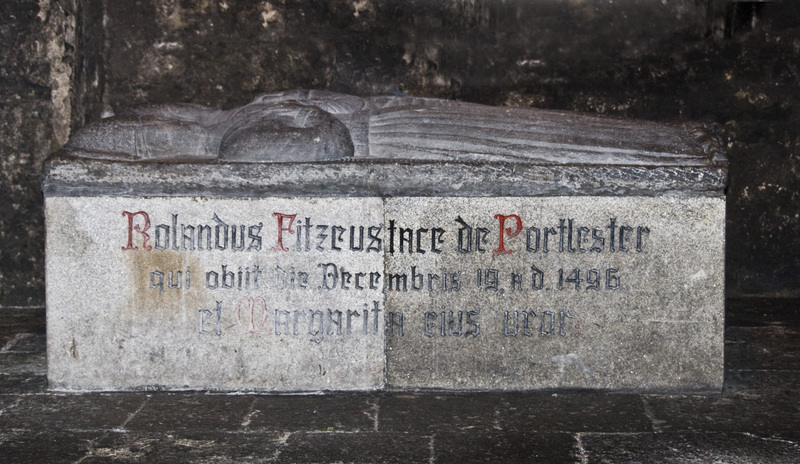 Portlester tomb (on RHS, effigies of Baron Portlester and his wife Margaret Dartas). In the porch (base of the tower), St.Audoen's Church, Dublin. Tomb on LHS is of a bishop. 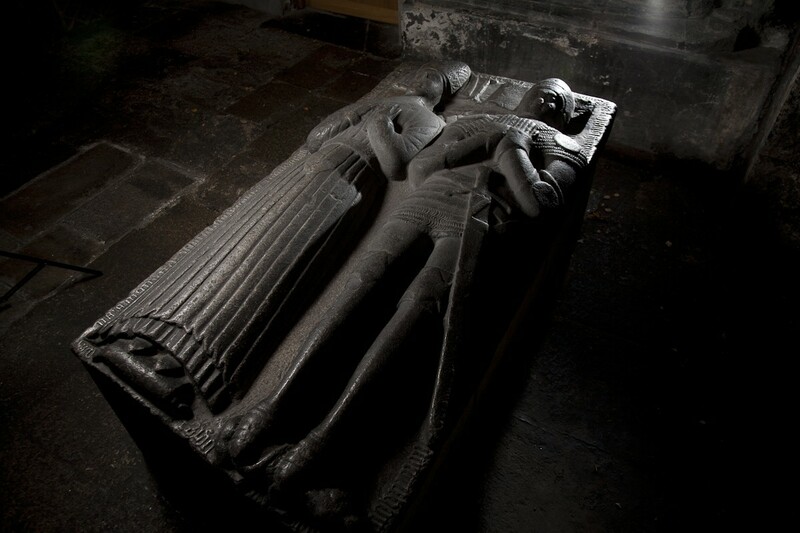 Portlester tomb, St.Audoen's Church, Dublin. Photo 2012. See full size and other shot. See other shot formerly here. See 2009 photo from here. Used with permission. Photo credit Con O'Donoghue. From Arran Henderson. Used with permission. From [Finerty, 1898]. Copy here. Note the base has been changed since. The modern plaque says the new base dates from 1949. 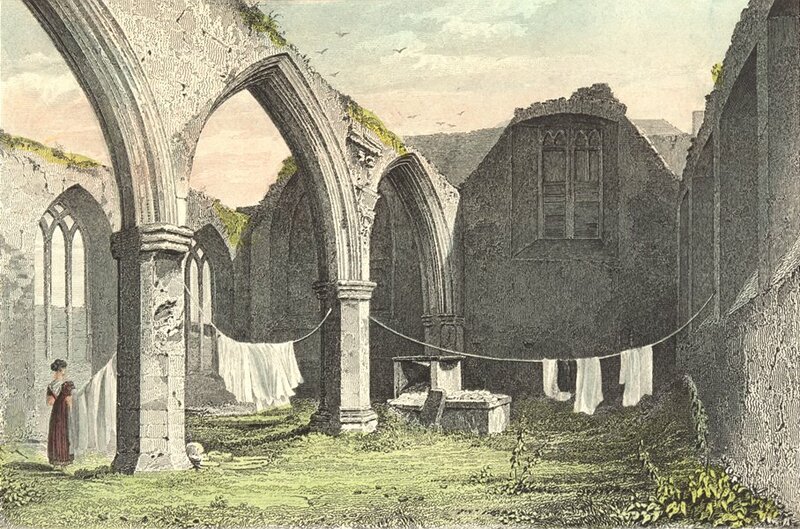 Portlester Chapel, St. Audoen's church, in ruins, with no roof. Engraving dated 1840. On sale at Antiqua Print Gallery. See also engraving of 1832. On sale on eBay. The roof was removed maybe late 18th century [McMahon, 2006]. 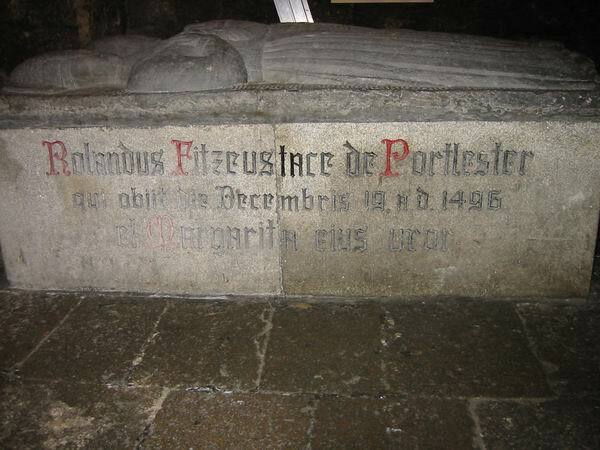 The Portlester tomb was not yet removed. 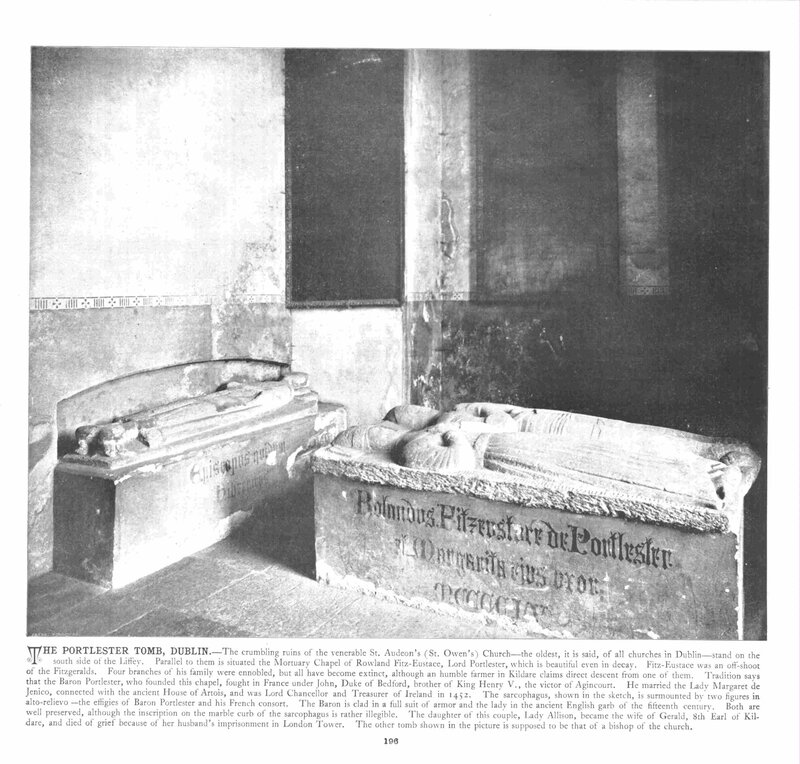 [1832 article] says the Portlester tomb was then located "near the east end of the south aisle" (i.e. in the Portlester Chapel). Plan of St. Audoen's church, 1866. Up is S.
Shows the Portlester Chapel to the SE. Shows the Portlester tomb now removed to the base of the tower. 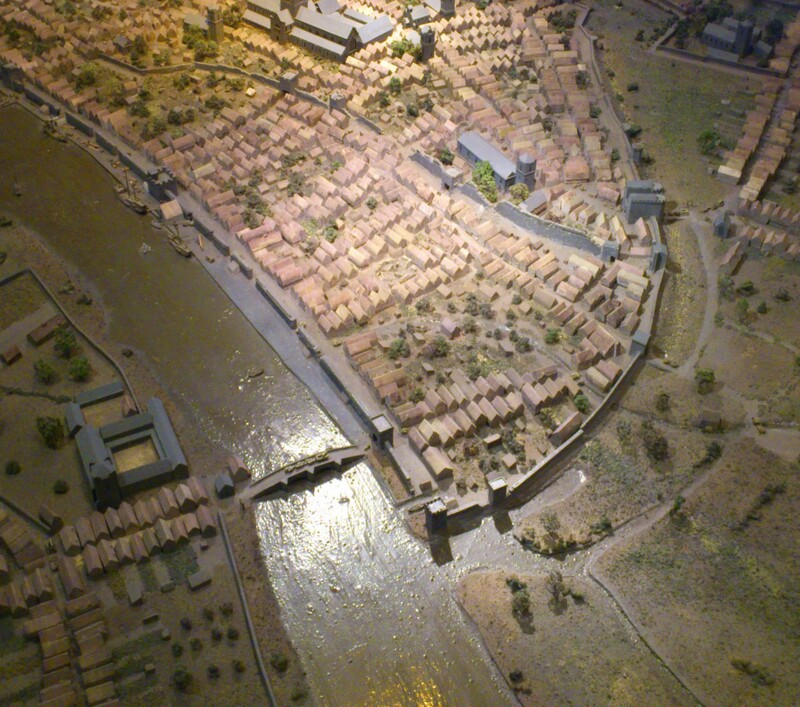 St.Audoen's church on a Model of Dublin around 1500. The city gate at the back of the church still exists today, as does some of the city wall. Dublin Bridge was for centuries Dublin's only bridge. St. Audoen's gate, the surviving gate of the old Dublin city walls, at the back of St.Audoen's church. St.Audoen's (and here and here). St.Audoen's is the only medieval church surviving in use in Dublin. St. Anne's Chapel was also ruined for many years, but has now been restored as a visitor centre. St.Audoen's is the Protestant church, not to be confused with the 19th century Catholic St.Audoen's beside it.